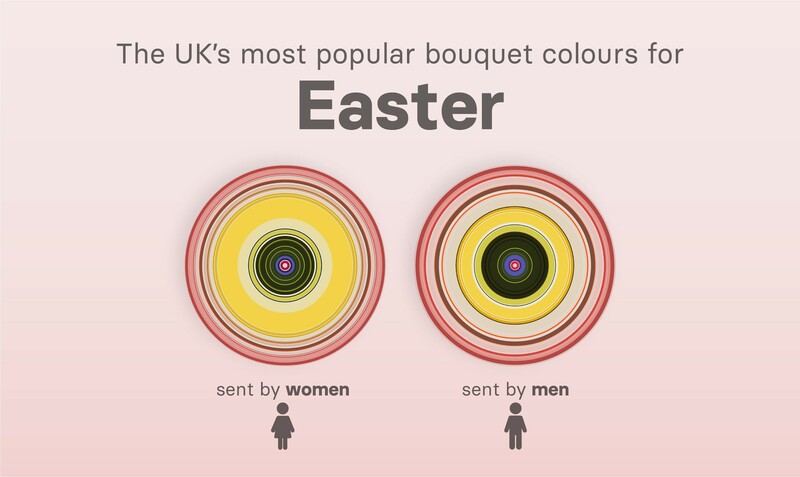 What is Your Easter Bouquet Communicating? Easter is joyous of all seasons, the temperature begins to rise, the evenings become lighter and flowers begin to bloom. As a nation, we take this time to exchange gifts, share meals and spend quality time with loved ones and a fresh bouquet of flowers is the perfect way to welcome in the spring season, but what are our colours of choice? And do these have hidden meanings? 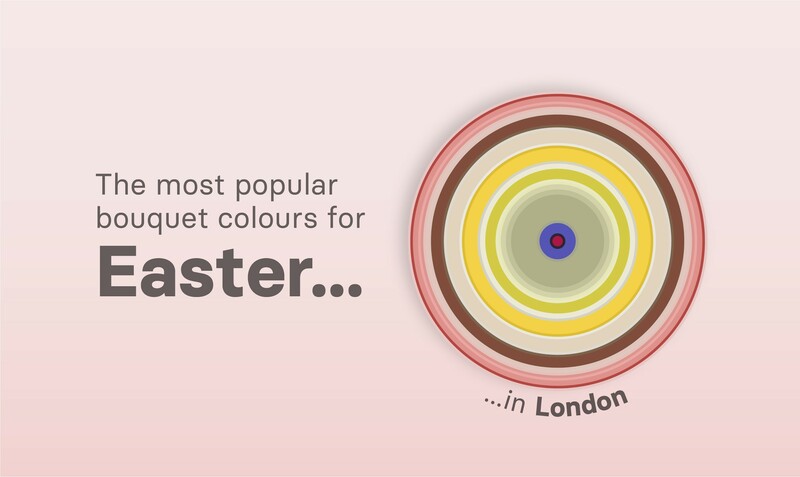 Our study revealed that the colour of choice to celebrate Easter is yellow for both male and female senders. This vibrant and joyous colour represents happiness and reflects the feelings of goodwill and celebration for the season. Interestingly, men in the UK tend to opt for more creams and whites, a delicate flower choice which represents feelings of serenity and purity, whilst pink features heavily for both genders. This delicate colour is often associated with romance, but can also communicate both gracefulness and innocence. 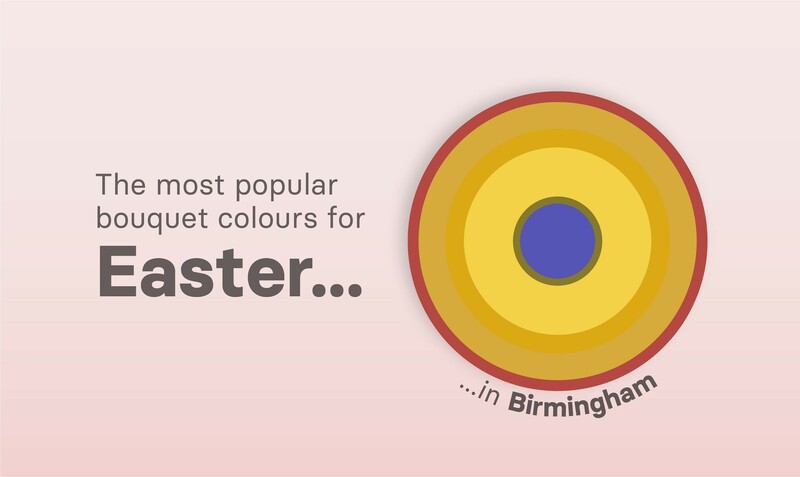 In London the UK's capital city the choices seem to reflect that of the nation with an equal mix of neutral colour palettes, whereas flower senders in Birmingham and Manchester paint a very different picture. In the West Midlands, a clear message is communicated with the choice of bouquets exchanging a language of happiness and pride, but interestingly this is closely followed by the royalist of colours - purple. This undeniably commanding colour brings wishes of dignity and success to its receiver. 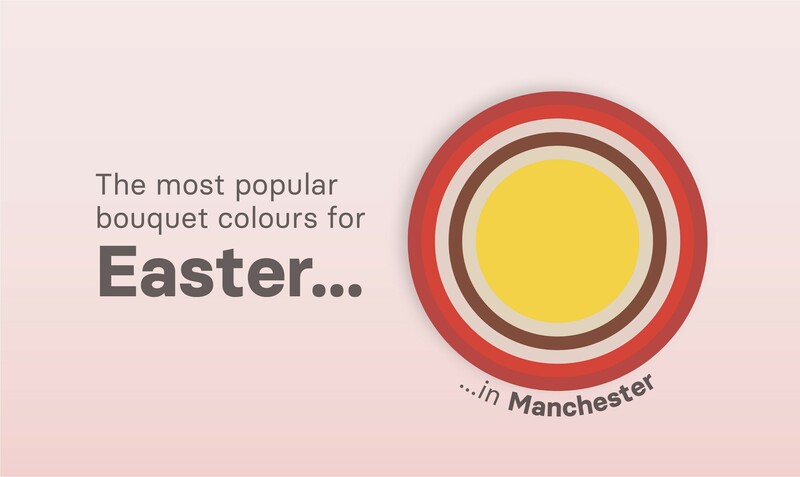 In the nort hwest Mancunians also opt for a joyful spring-like colour palette but surprisingly a large proportion also choose the most romantic of colours - red and pink. These rosy hues lend themselves to a more modern flower colour choice in celebration of Easter being the largest communicators of love, passion and admiration. Overall, both flowers senders tend to opt for similar colour palettes when it comes to this commemorative holiday, but what do our colour fingerprints look like when we delve deeper and examine our choices by budget? Further findings revealed that low spend flower senders tend to opt for a simple mixture of colours, precisely just five and these tend to be the brighter and bold of the bunch. 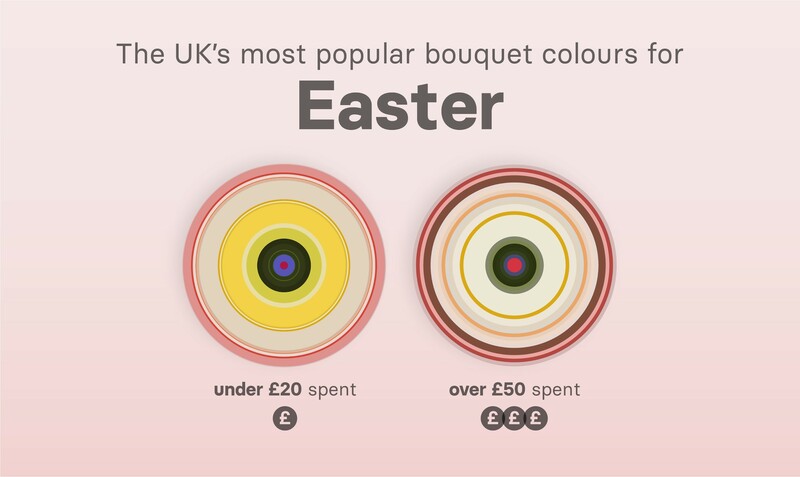 Yellow and pink petals are the two most popular which share a common language of merriness, whilst high spenders select more varied colour choices and these tend to be on the more neutral end of the spectrum. Today we use flowers to communicate our thoughts and feelings to one another, but the language of communication (Floriography) dates back to the 19th century where the arrangements of flowers sent secret coded messages to their receivers. This style of communication took place via 'talking-bouquets' which would be carried as an accessory with multiple connections attached to almost every flower which were referenced in floral dictionaries. Referenced and celebrated by some of the greatest writers in history, both William Shakespeare and Jane Austen celebrated this understated, yet powerful way of communicating. No matter the occasion we choose flowers to celebrate, show appreciation and fill our hearts and homes with joy and our flower colour choices communicate a deeper meaning to what we may have first thought. If you want to find out more about how the flower fingerprint graphics were created click here.